Angela, in "Sweet Sixteens" at Amherst High, singing "In the Mood", wearing tails and a red bow tie and cummerbund; in Senior Chorus, singing in the Mother's Day Concert at the Basilica of Our Lady of Victory. Playing parts in Amherst High productions of "Fiddler on the Roof" and "South Pacific". Being scolded by her basketball coach for shooting an "unladylike" hook shot. Imitating (lovingly) her German teacher at Amherst, Frau Farneck: "Vun mornink, vhen I vas a leetle kirl...." Mimicking our cousin Shirley Faso's throaty voice... "Heyyyyyy - 'little one'"; or our friend Sue Salter's "Child, what you be tellin' me?" Her natural ability to mimic anyone - Aretha Franklin, Diana Ross, Bob Dylan, Louis Armstrong ... Angelo always told her she should be in show business. Her cousin Bobby Coniglio remembers that once we gave him a baseball mitt, and Angela played catch with him and made him practice until he caught three in a row without dropping the ball. Her Yankees batting helmet. Her striped headband. Playing softball, hunting crayfish, throwing horseshoes, or fishing in the lake at Akron Falls Park, at the Coniglio family picnics. Calling her cousin Ronald "Clark", because he reminded her of the New York Islanders' Clark Gillies. Arguing with her "Uncle Phee-ul" Coniglio. Driving down the hill on Derby Road, towards Crystal Beach Amusement Park, she would try to be first to see the giant wooden soldier at the park gate. When she or Angelo said, "I see the soldier! ", we were officially there. Standing on my shoulders at the beach, diving into the waves. Walking down to "Eli's" for french-fries and a toffee bar. Going through the Park for cotton candy or a sucker, watching "Charlie" the automated skeleton piano player at the "Laff in the Dark" ride. Stopping for ice cream at the dairy on the way home, or for lemon ice at Virginia Pastry on Buffalo's West Side. Her contrariness, liking the opposite of what we did, rooting for teams we didn't like, arguing the other side just for the sake of argument. The only thing we ever put over on her was when she was about three. No one in the family liked turkey drumsticks, but that Thanksgiving, her mother and I and Angelo all insisted that we loved the drumsticks and there weren't enough for Angela to have one. She made a fuss and we all "generously" gave in. She loved them ever since. She didn't limit her arguing to the family, either. She would tease our good friend Ernie Warlick that she liked "McDonalds", not the "Henry's" hamburgers that he had a franchise for. This, in spite of the fact that Ernie was about twenty times her size. She used to stand in ONE of his shoes, with BOTH feet! 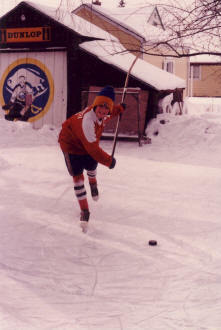 The ice rinks she would help build in our back yard, and her skating back there on frosty nights in a knit hat and scarf, stick-handling and clowning on the ice. Angela would put her own words to songs. Instead of Carly Simon's "You're no Good", she'd sing. "I'm so Good, I'm so Good, I'm so Good - Baby, I'm so Good!" She'd sing: "Gonna Take a Sental-mental Journey".... and her words to the song Aquarius: "Mystic crystal bo-bination..."
Going from hockey school to vacation in Cape Cod, changing in the car. Sharing a cottage with the Suhr's at the Cape: Angela "arguing" with Hank over anything in general. Fishing and crabbing (and crabbing) at Cape Cod. Seeing Don McLean and the Four Aces at the Melody Tent. Our first time on a Cape Cod beach, our "nature guide" in hand, we discovered little blobs of protoplasm; ocean creatures called "sea cucumbers". Angela thought that was hilarious, and ever after, when she spied flotsam on any beach, she'd say "Look, a sea cola!" (empty Coke can), or she'd point and say authoritatively, "sea orange! ", or "sea chips! ".